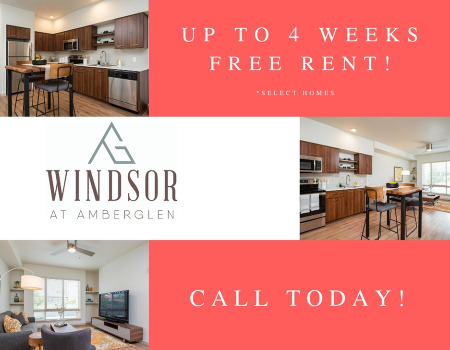 Windsor at Amberglen is a new community located in Hillsboro, OR. Just off Cornell and a quick walk to The Streets of Tanasbourne including major shopping, restaurants, and neighborhood walking trails. Windsor is in an ideal location for the early morning riser or the late night social butterfly. These new apartment homes include one, two or three bedrooms ranging in size from 660 sq ft to 1480 sq ft which provide enough space for comfortable living. The community offers an outdoor seasonal swimming pool and a community courtyard with BBQ area. Windsor has a 74 walkscore and a 31 transit score. We welcome up to two pets per household. German Shepherds, Doberman Pinschers, Chows, Rottweilers, Pit Bulls, American Staffordshire Terriers, and mixed breeds including the above are not allowed unless they are an assistance or companion animal. One pet: $300 deposit, $25/month. Two pets: $450 deposit, $50/month.